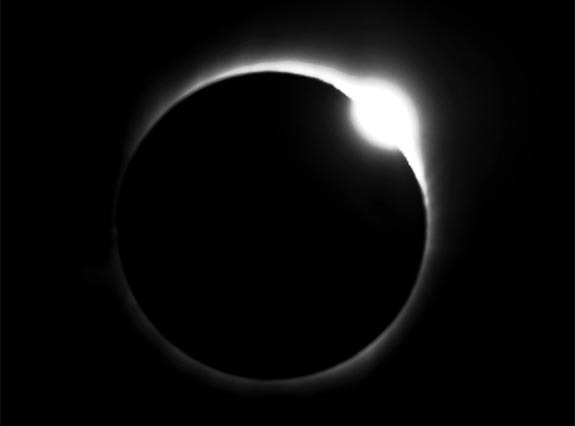 Don’t Miss This: The Sun Will Morph Into a Diamond Ring on August 21 - Atlanta Diamond Co. The “Diamond Ring Effect,” which was first explained by Francis Baily in 1836, occurs when the moon completely masks out the sun during a total solar eclipse. Due to the rugged lunar landscape, the black outline of the moon is not smooth. Tiny beads of sunlight can still shine through in some places and not in others as the moon slowly grazes past the sun. NASA warned that skywatchers should NEVER look at a partial solar eclipse without proper eye protection. Looking directly at the sun, even when it is partially covered by the moon, can cause serious eye damage or blindness. Only during totality, when the sun’s disk is completely covered by the moon, is it safe to view the eclipse with the naked eye, says NASA. Learn more about solar eclipse eye protection at Space.com. During the solar eclipse, the moon’s shadow will pass over all of North America. The path of the umbra, where the eclipse is total, will stretch on a bent path from Salem on the West Coast to Charleston on the East Coast. This will be the first total solar eclipse visible in the contiguous United States in 38 years. The next total solar eclipse will take place in North America on April 8, 2024.